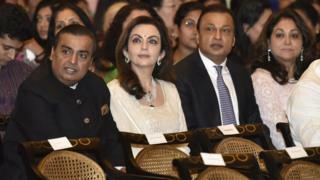 India's richest man Mukesh Ambani has paid a debt payment owed by his brother, saving him from spending time in prison. Anil Ambani faced a prison sentence after a deal between his firm Reliance Communications (RCom) and telecoms giant Ericsson collapsed. That left his firm owing Ericsson 5.5bn rupees ($80m; £60m), which it failed to pay by a court deadline. The move marks a new twist a long-running feud between the brothers. RCom failed to comply with an India Supreme Court order to pay Ericsson the money by 15 December last year. The court found him guilty of contempt, giving him another four weeks to pay or go to prison. On Monday, RCom said the debt had been paid. "My sincere and heartfelt thanks to my respected elder brother, Mukesh, and (his wife) Nita, for standing by me during these trying times, and demonstrating the importance of staying true to our strong family values by extending this timely support," Anil Ambani said. The two brothers have long had an acrimonious relationship, fighting over their father's businesses after he died in 2002 without a will. The Reliance empire was divided between the two brothers in 2005 after a bitter seven-month feud. The brothers have fought bruising court battles in the past over natural gas interests. Mukesh Ambani is worth more than $54bn, according to Bloomberg. His firm Reliance Industries, whose activities span from oil to telecommunications, is among India's most valuable companies. By contrast, Anil Ambani has an estimated net worth of around $300m, Bloomberg said. The Ambani family made headlines last year with the lavish wedding of Mukesh Ambani's daughter, Isha Ambani, which featured a performance from US singer Beyoncé.